On November 4, 1979, radical Iranian students seized the United States Embassy complex in the Iranian capital of Tehran. The immediate cause of this takeover was the anger many Iranians felt over the U.S. President Jimmy Carter allowing the deposed former ruler of Iran, Shah Reza Pahlavi, to enter the U.S. for medical treatment. In Iran, this was believed to be an opening move leading up an American-backed return to power by the Shah. The crisis which followed this seizure created a near state of war, ruined Jimmy Carter's presidency, and began an environment of hostility between America and Iran which continues to this day. By 1978, unrest against the Shah had escalated into a violent uprising against his authority called the Iranian Revolution or the Islamic Revolution. On January 16, 1979, the Shah fled into exile for a second time, traveling to various countries before finally entering the U.S. for cancer treatments in October, 1979. After the Shah's departure, the Ayatollah Ruholla Khomeini returned from his own exile in France to take power over Iran. Khomeini was a leading member of the Shia Muslim clergy. The Shia are a subset of the Islamic faith, and form the majority of the Iranian population. Vital parts of this Islamic Revolution were propaganda and demonstrations against the United States and against President Jimmy Carter. After the Shah's entry into the U.S., the Ayatollah Khomeini called for anti-American street demonstrations. On November 4, 1979, one such demonstration , organized by Iranian student unions loyal to Khomeini, took place outside the walled compound housing the U.S. Embassy. Members of these Iranian student unions scaled the walls of the U.S. Embassy on November 4, 1979, taking 63 Americans hostage. Three more U.S. citizens were taken prisoner at the Iranian Foreign Ministry, for a total of 66 hostages. Within three weeks, the hostage-takers released several women and African-Americans, leaving 53. A sick hostage was later released, reducing the number to 52. Throughout their captivity, the hostages were paraded in front of television cameras, often blindfolded or hooded. Though the hostage-takers were not members of the Iranian government or military, their obvious, publicly-stated loyalty to Khomeini and the Islamic government created an international crisis. Immediate official American reactions involved halting oil exports from Iran, expelling many Iranians living in the U.S., and freezing Iranian government assets and investments. Many Americans called for military action to free the hostages, but the situation became much more complicated when the Soviet Union invaded Iran's neighbor, Afghanistan, in order to crush an Islamic-based rebellion against that nation's Marxist government. President Carter now faced a crisis with oil-rich, but hostile Iran, a new Cold War crisis with the Soviets, and a growing sense in his own country that he was increasingly showing himself to be an ineffective leader. Partly to counter the criticisms against him, as well as to free the hostages, President Carter ordered a military rescue mission code-named "Operation Eagle Claw." This mission was a total and complete failure resulting in the deaths of eight U.S. military personnel. On April 24, 1980, units of the rescue force landed in the Iranian desert to refuel their aircraft before heading to Tehran. A confusing series of events took place at this refueling point, including failed equipment, and desert sandstorms which reduced visibility. As a result of these problems, the rescue was called off. During the retreat, one of the helicopters collided with a transport airplane, causing an explosion which killed eight members of the rescue mission. Several of the burned American bodies were later part of grisly street demonstrations protesting the abortive U.S. "invasion" of Iran. A second rescue attempt was planned but never implemented, largely due to equipment failure. On July 27, 1980, the former Shah died. Then, in September, 1980, President Saddam Hussein of Iraq invaded Iran. These two events led the Iranian government to enter into negotiations with the U.S., with Algeria acting as a mediator. Domestically, the Hostage Crisis ruined President Carter's presidency. Unfortunately for him, the one-year anniversary of the embassy takeover fell on the same day as the United States Presidential election of 1980. Carter lost that election to former California Governor Ronald Reagan, who, though never publicly criticizing Carter over the hostage crisis, promised to rebuild American power and influence in the world. The negotiations between Iran and the U.S. culminated in a deal that released the hostages and the eight billion dollars worth of frozen Iranian assets. Moments after Ronald Reagan took the oath of office on January 20, 1981, the hostages were allowed to fly out of Iran after 444 days of captivity. The legacy of this prolonged crisis continue to affect Iranian-U.S. relations over 25 years later. Iran and the U.S. still do not have official diplomatic relations with each other, and both nations hurl hostile accusations at each other over issues such as the American invasion of Iraq and Iranian nuclear research. The June, 2005 election of Mahmoud Ahmadinejad as President of Iran opened up old wounds. Several of the former hostages contend that Ahmadinejad was one of the leaders of the student groups that seized the embassy in 1979. The Iranian government denies he had anything to do with the seizure, but it is another sign that tensions remain over the entire episode. We offer all kinds of certification exams including 646-578 and 70-685. Our guaranteed Microsoft certifications exams are freely accessible all around the world of VCP-410 exam and PMI-001 guide. 1981-1988-Contra War in Nicaragua. Honduras served as a major base for the Contras, and had a large American military presence in Honduras during the war. List of Americans held hostage and the servicemen who lost their lives in the rescue attempt--From the James Earl Carter Library. It's Time for the US and Iran to Sit Down and Talk - An opinion piece by Bruce Laingen, who spent 444 days as a hostage. Online Casebook - The Iranian Hostages Case - Online international law cases from Stanford University. Operation Eagle Claw - Including a bibliography, articles, and a QuickTime movie. TIME: Can Iran Be Forgiven? - Essay by Scott Macleod for Time Magazine. 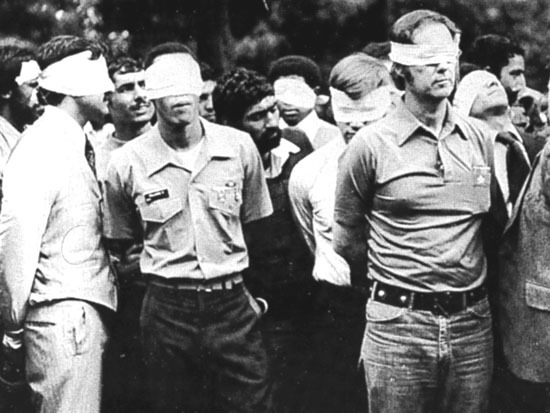 US-Iranian Relations and the Hostage Crisis--Well-researched account of the hostage crisis and its influence in the fall of Jimmy Carter and the rise of Ronald Reagan. Joel Mayo - Sergeant, United States Air Force - Killed In Action at Desert One. The 80s Server Icons: Jimmy Carter --Short biography of Jimmy Carter. The 80s Server Icons: Mohammed Reza Shah Pahlavi--Short biography of the Shah.